Folk story or oral family history? Written in the 1930s by W.A. Edwards, grandson of Mrs. Edwards who lived at the Big Bend during the war and grandfather of Wardsville historian, Ken Willis. Bill wrote articles and local news items for the Bothwell Times, Glencoe Transcript and farm reports for the London Free Press (for 25 years). In all the annals of Canadian history, teeming as they are with deeds of daring and heroism, no figure stands out more strikingly than that of the gallant Tecumseh, chief of the Shawnees and friend of Canada. Pontiac, plotter and politician, brother of Tecumseh stands for a time in the spotlight of those times but whereas, the life of Pontiac was smothered out dismally in trickery, that of Tecumseh went forth in a blaze of glory. Ontario and Western Ontario in particular, can boast of no more famous figure than this dauntless Shawnee. In the days when Western Ontario was a wilderness and settlers few and far between, it was the story of Tecumseh that thrilled young Canadians. Down through the years those stories lived until Tecumseh became visualized as a national hero and patriot who died for his cause. Great as the majesty of Tecumseh’s life, greater still is the mystery of his death. Countless are the stories told of that last stand against overwhelming odds at Moraviantown, when Proctor and his army took to flight at the first shots, leaving Tecumseh and his warriors to uphold the honour of the British army. Why did Proctor do such a thing? Why was it that he could desert an ally such as Tecumseh in his hour of need? Previously, Proctor had proven himself a fearless fighter and a resourceful and competent commander, against greater odds and under more serious handicaps. At Moraviantown, thanks to the sagacity of Tecumseh, he had all that a strategist could desire. He was without danger from an attack in the rear. His right flank was protected by a swamp, his left rested securely along the river Thames, deep here and unfordable. Proctor, with the support of experienced soldiers, in conjunction with Tecumseh and his warriors, stood a good chance of success. Yet, Proctor, almost before the first shot, fled before the vanguard of Harrison’s army, leaving Tecumseh to sacrifice his life. Why was it so? 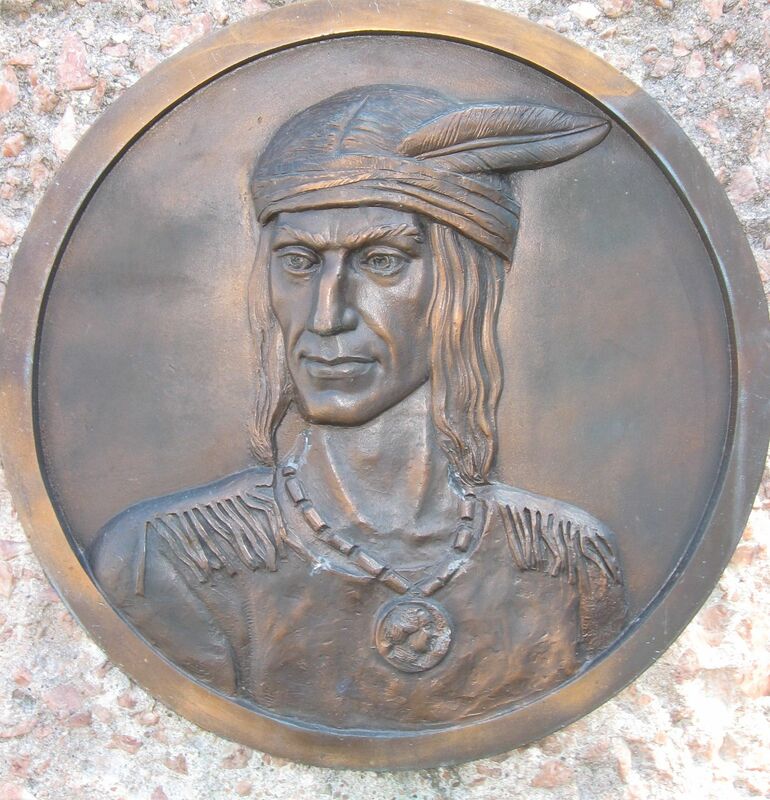 Proctor did have a reason, or thought he had, for deserting Tecumseh. Let me tell you the story as it was told to me years ago by a chief of the Oneidas. Here is what the old chief says: Tecumseh was an Indian of exceptional intellectual ability. He had a splendid physique and was of a powerful personality. He was as fine a specimen of physical manhood as could be found in all the Canadas. Of middle height, beautifully proportioned, a handsome face, eyes like an eagle and a graceful though haughty manner. Friend and foe admired his ability and his bravery. Just when Proctor and Tecumseh met is not known. Nothing definite can be recalled prior to the attack and capture of Detroit. When this prize, later had to be abandoned, owing to Barclay’s defeat on Lake Erie, Proctor, now in command, was forced to retreat through the Long Woods of Western Ontario, in a desperate effort to reach the Niagara Frontier, a long, trying and hazardous manoeuvre. Already Proctor had proven himself as a general but in the retreat from Detroit, he proved a failure. Instead of abandoning Detroit he practically endeavoured to carry the major portion with him in retreat. Large stores of clothing and supplies, cumbersome paraphernalia were loaded onto gunboats and towed up the Detroit River, across the St. Clair and on up the winding Thames. On these gunboats too, the ladies of Proctor and his officers were conveyed. Altogether, the whole business wasted time and caused disastrous delay. Just whom Mrs. Proctor and her retinue on the boats were and of their character and kind, the old chief did not tell. Hitherto the wife of Proctor on two occasions had met Tecumseh. At a council held in a storehouse at Amherstburg where Tecumseh perhaps made one of the most remarkable addresses of his career, she had cunningly connived to address herself to the great chief and in some way developed an admiration for him. Ignorant of the ways of white women, and filled only with the zeal of his cause, Tecumseh was blind to all else and only when a message came to him just before leaving the town, a message for a clandestine meeting, did he understand the situation. Tecumseh treated the occurrence with indifference and silence. But such women are not so easily daunted. Watching her opportunity, she sought out the object of her admiration and one night where she was sure no one would know, disguised as an Indian maiden, she came to Tecumseh beneath a great oak by the river, a retreat to which the great Indian often went to be alone. She had trusted none would see or know but at a luckless moment, one of Proctor’s scouts came upon them just as Tecumseh with all the sternness, strength and stateliness of his splendid personality spurned her advances and bid her be gone. To save herself she laid the blame upon him. Proctor may have had his own suspicions. Likely he did understand and knowing Tecumseh as he did he knew that the woman’s story was false and yet to save his honour and that of the woman, Tecumseh must be sacrificed. From thence he looked to it that Tecumseh had no second chance. In the continued retreat the women were all consigned to the slow moving gun boats. Tecumseh and his warriors were posted so as to constantly form a sort of rear guard to Proctor’s little army. At other times Tecumseh was sent far afield on some pretended scouting expedition. Only to a selected few was Proctor’s purpose plain. All Canadians who know Canadian history know what followed throughout that tedious retreat. Thrice the Shawnee chief pleaded with Proctor to make a stand as some favourite place of ambush was passed. History relates that Tecumseh’s council was in vain owing to the fear in Proctor’s heart of coming to grapple with Harriston’s dreaded Kentucky riflemen. The full truth is not told. Boats Abandoned. The retreat was delayed by Proctor’s determination to only keep apace with the slowly creeping boats. At McGregors’ the boats became fast in the shallows and they with much supplies and ammunition had to be abandoned. The women however, were transferred to some half dozen war canoes and continued rapidly up the river. Close to McGregors, but a little West, Tecumseh planned to ambush the now closely pursuing Americans. The river lay to the right. A swift tributary raced down between steep banks on the left. There was only the trail and a narrow defile between. The invaders were sure to walk blindly into the trap. But Proctor was obdurate. The women were yet too near and they must mark time while the war canoes could get further from the conflict. And so the inevitable battle was delayed day by day, with the Americans hanging close in pursuit and exchanging an occasional shot with Tecumseh’s guard. Nearing Moraviantown, where long had been established a mission, Tecumseh realized that further retreat was not only dangerous but undesirable. Harriston and his Kentucky riflemen were tramping hard on the heels of the fugitives. The battle could not be delayed longer. Pretending the interest he did not seemingly possess, Proctor at last listened to Tecumseh’s plans and allowed him to prepare to meet the enemy. The plans were good and worthy of a general, had Proctor done his part, but he fled. Between the lines of the history of Moraviantown, or the Battle of the Thames, there always to the close student ran a mystery, an unanswerable why to the whole affair. Certainly Proctor’s action in deserting the battlefield before the battle had hardly begun had some sinister secret all it’s own. That secret has puzzled Canadians for a 100 years and more. Always there has seemed a darker side to the story. Always, too, some allowance may be made for the exaggeration a story receives as time goes on. Secret of Burial. Like the burial of Moses, the grave of Tecumseh has for over a century been the subject of mystery. Shot down by Col. Jackson, commander of the Kentuckians, the charging horsemen swept on after the enemy later to return for the body of their dreaded foe. For had they not boasted that they would make razor straps of the Shawnee’s hide. But the body was never found. True to the last his faithful warriors had removed and hidden the body. Old settlers at Canton, Dolson’s, Ward’s Station and other settlements along the Thames, tell how Tecumseh was buried near the battlefield in a shallow grave and a large log rolled upon the spot. Since then numerous “finds” have been made of the noted Shawnee’s remains. Years ago, near the St. Clair, they found his skeleton. Later, it was unearthed not far from the battlefield. Recently it was again found in a shallow grave on Walpole Island and lastly, James E.Black of Bothwell, declares he saw Tecumseh’s grave on the Moravian Reservation in a secluded and secret spot many years ago. Beside No. 2 Highway, a few miles West of Wardsville and a mile or so East of Thamesville in a park beside the Thames, Canadians have erected a marble monument to Tecumseh. Thousands visit the spot every year but many have never heard the story of Tecumseh, nor dream they stand on the edge of an historic battlefield. The inscription merely states to whom the monument is erected, why and wherefore he fell. Posted on October 21, 2011, in Longwoods Barn Quilt Trail, War of 1812 and tagged Battle of the Thames, Proctor, Tecumseh. Bookmark the permalink. 5 Comments. Which Josiah is this? ?I have 2/Josiah with Susan chamberlain..My grandparents…. whom ever you are Betty,we must be related /JosiahP/JosiahP are my grandaprents on my mom side.,of Vermont..NICE!!!! It is a fascinating story. I asked local historian Ken Willis and grandson of story’s author if the story is true. Willis claims it is his family’s oral history. The grandparents of the author lived at Big Bend on the Thames River and would have known all the goings on at the time of the War of 1812. Everybody canoed right by their farm. The women would have known about any intriguing gossip.